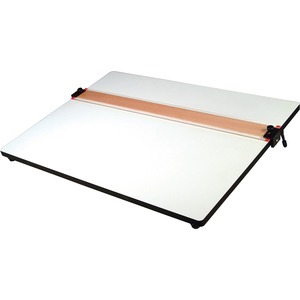 Drawing board features a parallel straight edge that is easy to grip and adjustable. Move the straight edge easily over the board. Straight edge stays in place where you put it. Stopper grips allow adjustment of the board off the table without slipping. Rubberized feet prevent slippage and fold in for easy storage. Use the carry handle to transport. The PVC-covered board is 5/8" thick.